Before the dominance of chains and big box stores, most people did their shopping in town, at a store that was generally owned by an individual, not a corporation. Even before Jewel came to Libertyville, there was Triggs & Taylor Grocery. From 1892 until 1942, Triggs & Taylor was the place in town to get your groceries. For more than fifty years Triggs was one of the landmark businesses in downtown. Photograph of Milwaukee Avenue shortly before the fire in 1895. Triggs & Taylor is the building on the left. Photo courtesy of the Libertyville-Mundelein Historical Society. Triggs & Taylor was started in 1892 by J. Eli Triggs and C. W. Taylor, who offered a wide variety of products such as dry goods and meats. The store was located on the corner of Milwaukee and Cook avenues. However the building was destroyed by fire on August 31, 1895. The blaze swept through the business district on the east side of Milwaukee Avenue. A few days after the fire, Triggs & Taylor had set up a makeshift store next to the ruins of the old one, selling their goods to the recently ravaged area. The store remained in this state throughout the fall and winter while a more durable and attractive brick structure was put up. Picture from inside of Triggs & Taylor, September 1903. 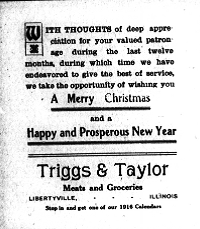 Triggs & Taylor advertisement in the Lake County Independent, December 24, 1915. One of the things that set Triggs & Taylor apart from other grocers was a reputation for quality. The idea was relatively simple: combine great service and products and the people will shop at your store. Triggs & Taylor didn’t seem satisfied with just getting by and was usually pushing forward to improve upon their store. In 1906 they set up a cold storage plant to keep their produce and meat fresh. Cold storage also helped bring a variety of produce to their customers and Triggs & Taylor had a reputation for having one of the best meat markets in the area. J. Eli & C. W. both served on community boards and councils. As was often the case with businessmen of this time, the owners were part of the very community to which they sold goods. Wagonload of meat being delivered to Triggs. Compliments of the Illinois Digital Archives. In 1909, C. W. Taylor sold his shares to J. Eli Triggs to pursue other business interests. In 1914 J. Eli sold his store to his son, Ross Triggs, and the son of C. W. Taylor, Ross Taylor. Both Rosses worked at the store for years and were also involved in the community. A few years later Ross Taylor sold his share to A. L. Johnson. This partnership of Triggs & Johnson would last until 1932, when Johnson sold his shares to Ross Triggs and left to run a bakery in Waukegan. 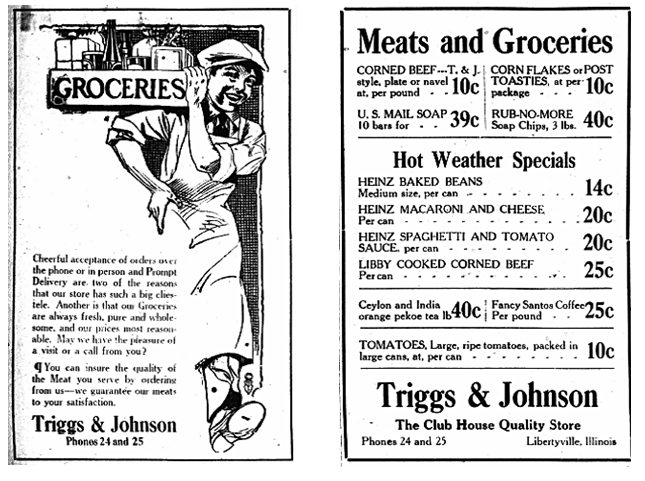 Advertisements for Triggs & Johnson from the Libertyville Independent. The ad on the left is from September 1921 and the other from July 1921. After A. L. Johnson left the store, Ross Triggs started a major renovation of the store’s layout. 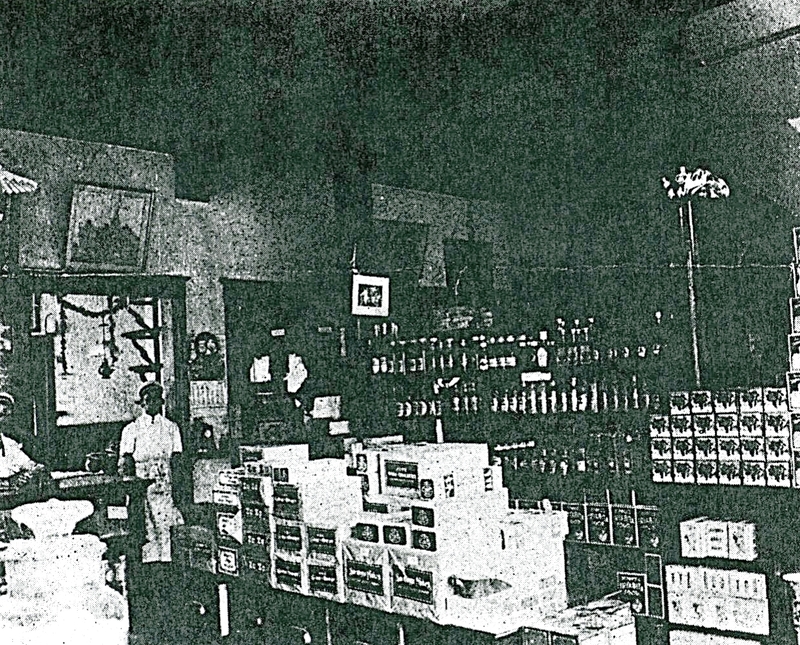 Since the construction of the store after the fire, there had been a partition separating the butcher’s part of the store with the dry goods section. With the idea of faster service in mind, Triggs put the cashier’s station up front and took down the partition wall. By then Triggs was also part of Honor Shield, a consortium of stores. In 1942 Ross had had enough of the grocery business and decided to retire. He sold the business to A. Phillip Simpson and his brother A. F. Simpson. While the Triggs & Taylor store is no longer with us, the building is still here and is currently home to Steve’s Formalwear at 430 N. Milwaukee Avenue. View looking south on Milwaukee Avenue from about 1912. Triggs & Taylor is the building on the left side. Courtesy of the Illinois Digital Archives. “Cold Storage Plant Completed.” Lake County Independent [Libertyville] 22 Aug. 1906: 5. Print. “Local Store Is Being Remodeled.” Lake County Independent [Libertyville] 18 August 1932, p. 1. Print. “Remodeling of Triggs & Johnson Store Complete.” Lake County Independent [Libertyville] 25 August 1932, p. 1. Print. “Triggs Grocery An Up-To-Date Store.” Lake County Independent, 19March 1909, p. 7. Print. “Ross Triggs Sells Market Business to Simpson Brothers.” Independent Register 4 June 1942, p. 1. Print. Eli Triggs. Independent Register [Libertyville] 1909 Nov. 11: 1. Print. “Libertyville, An Ideal Summer Resort.” Independent Register 9 September 1903, p. 10. Print. Triggs & Taylor. Independent Register [Libertyville] 1915 Dec. 24: 1. Print. Triggs & Johnson. Libertyville Independent , 1921 July 28: 4. Print. Triggs & Johnson. Libertyville Independent, 1921 Sept. 1:8. Print. Triggs’ Grocery Store. Digital image.Illinois Digital Archive. Illinois Secretary of State, 21 Aug. 2012. Web. 23 Dec. 2015. <http://www.idaillinois.org/cdm/singleitem/collection/cookmemo11/id/269/rec/24&gt;. “Milwaukee Avenue Looking South From Cook Street.”Illinois Digital Archives. Illinois Secretary of State, 28 Aug. 2002. Web. 23 Dec. 2015. <http://www.idaillinois.org/cdm/singleitem/collection/cookmemo11/id/203/rec/12&gt;. December 23, 2015 in The Past Is Present. This is a wonderful accounting of the business dealings of my Great-Grandfather, John Eli Triggs, and my Maternal Grandfather, Ross S. Triggs. Our family still talks of their success and Ross’ daughter, Marilyn (my mother), still reminisces about her Grandfather and Father, even in her 90th year.